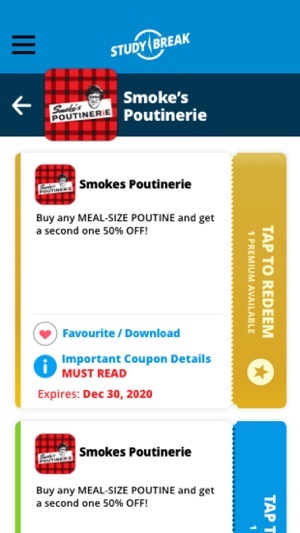 The Study Break App offers students awesome savings! 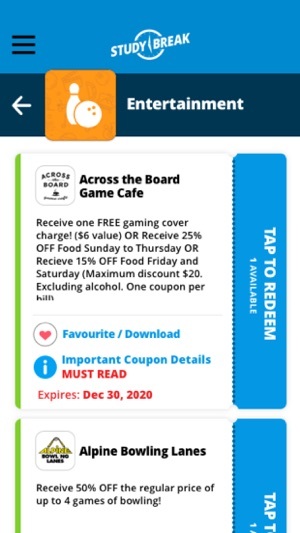 Now post-secondary students can spend more time studying and more time saving with great deals for your favourite restaurants, stores, events, activities, and more! It’s easy, convenient, fun to use, and a great resource for those living the busy academic lifestyle. You can save even more by upgrading to Study Break – Premium. 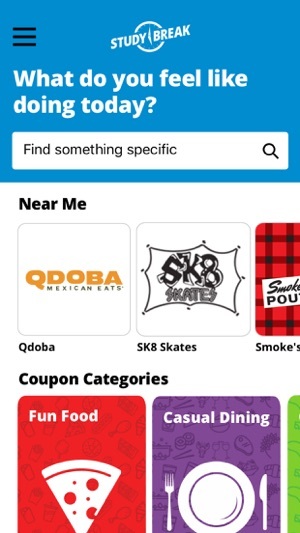 Get exclusive access to even MORE coupons, MORE discounts, and MORE fun. Who wouldn’t want that? After all, MORE is BETTER! 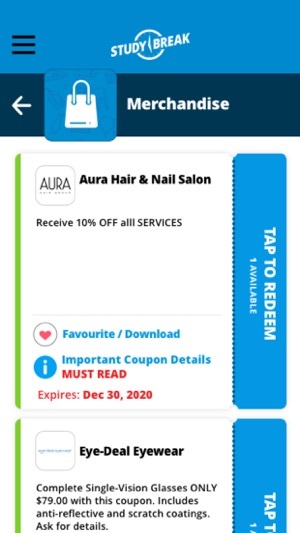 -	Receive your FREE Activation Code from your university, college, or post-secondary institution. 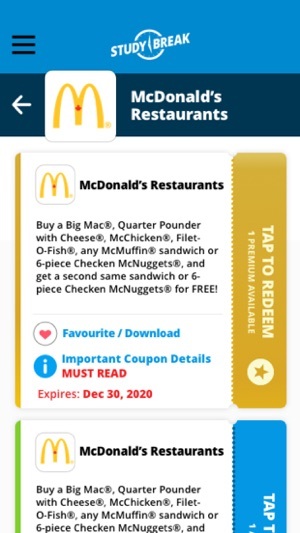 -	Download the App, create an account and activate the App with provided Activation Code. -	Purchase a Study Break – Premium subscription to save even more! -	Browse through the categorized coupons. 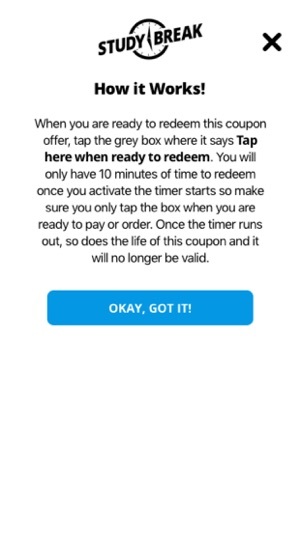 -	Tap and redeem the coupon you want to use. Study Break is a must for any university or college student! 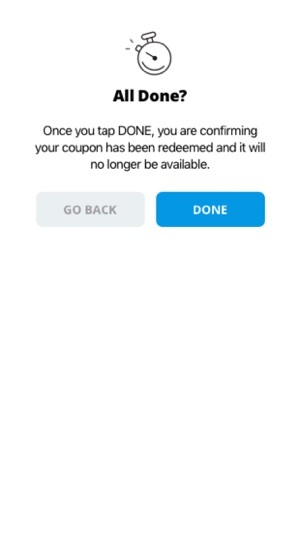 In addition to our great coupon selection, our new App now allows Push Notification functionality to keep you informed of important news, new coupons and expiring coupons. This allows you to make the most of your subscription. Easier to use and more convenient. Requires iOS 10.0 or later. Compatible with iPhone 5s, iPhone 6, iPhone 6 Plus, iPhone 6s, iPhone 6s Plus, iPhone SE, iPhone 7, iPhone 7 Plus, iPhone 8, iPhone 8 Plus, iPhone X, iPhone XS, iPhone XS Max, iPhone XR, iPad Air, iPad Air Wi-Fi + Cellular, iPad mini 2, iPad mini 2 Wi-Fi + Cellular, iPad Air 2, iPad Air 2 Wi-Fi + Cellular, iPad mini 3, iPad mini 3 Wi-Fi + Cellular, iPad mini 4, iPad mini 4 Wi-Fi + Cellular, 12.9-inch iPad Pro, 12.9-inch iPad Pro Wi-Fi + Cellular, 9.7-inch iPad Pro, 9.7-inch iPad Pro Wi-Fi + Cellular, iPad Wi-Fi (5th generation), iPad Wi-Fi + Cellular (5th generation), 12.9-inch iPad Pro (2nd generation), 12.9-inch iPad Pro Wi‑Fi + Cellular (2nd generation), 10.5-inch iPad Pro, 10.5-inch iPad Pro Wi‑Fi + Cellular, iPad (6th generation), iPad Wi-Fi + Cellular (6th generation), iPad Pro (11-inch), iPad Pro (11-inch) Wi-Fi + Cellular, iPad Pro (12.9-inch) (3rd generation), iPad Pro (12.9-inch) (3rd generation) Wi-Fi + Cellular, iPad mini (5th generation), iPad mini (5th generation) Wi-Fi + Cellular, iPad Air (3rd generation), iPad Air (3rd generation) Wi-Fi + Cellular and iPod touch.